This contains two short stories. The first is a taught prison drama that could easily be enjoyed by anyone who hasn’t read any of the 100 bullets. It is reminiscent of the first book as we are introduced to new characters, and a strong setting with its own culture and patois. The second tale sees the return of two people from volume four and is more of a character study than our usual conspiracy thriller. Both are enjoyable and very different. Azzerello takes his time and isn’t bothered about furthering his mega-plot but shows off his abundant writing talents. The art is great stuff. Highly creative angles and panels that blow the competition away along with smart intercutting make this a visual feast. This is one book you want to see the script for just to see how Azzerello and Risso collaborate on the visualisation. Lovely colours, superb shadows and beautiful lighting as always. 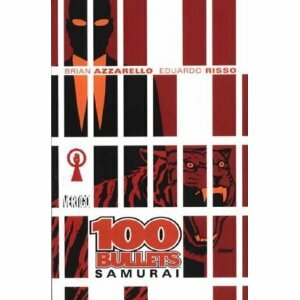 This entry was posted in Graphic Novel and tagged Brian Azzarello, Thumbs Up! by 365gn. Bookmark the permalink.